In Book VII of Plato’s Politeia, at 540c, Glaucon declares that, with his words, Socrates’ has “made the rulers consummately beautiful (καλόν) men…just like a sculptor.” Earlier in Book VII, at 529e, Socrates refers to the works of Dædalus as worthy of study. As stated in footnote 135 of Sachs’ translation of the Republic, Plato mentions Daedalus (Δαίδαλος) several times in his dialogues: at 97d in Meno and at 11c in Euthyphro. In Texts on Socrates, West also identifies 121a of Alcibiades I (p.55, n.33). In reading these various texts*, I noticed recurring references to Daedalus, and it made me wonder: Are these references random or do they form a logical pattern of some sort? Examining these references in the order listed above, we see that, in the Republic, the one mention of Daedalus comes from Socrates explaining that one can study the physical for examples of the ideal so long as one keeps in mind that these are but a detail of a much larger whole. In this passage, drawings of Daedalus’ sculptures are seen as prime examples of geometric beauty but more or less worthless to the student wishing to learn geometric principles. In Meno, at 97d, Socrates, in explaining the relationship of “right opinion” to “true knowledge,” uses the supposedly animate sculptures of Daedalus as a metaphor. He tells Meno that a right opinion is like a Daedalic sculpture which may leave you at any moment. Just as the sculpture must be fastened down in order to be retained, so one must pin down a true opinion, in the form of knowledge retained through memory, in order to not lose sight of what is true. In Euthyphro, at 11c, Socrates likens Euthyphro’s assertions to Daedalus’ sculptures, and then jokingly refers to himself as a relative of Daedalus and states that if he vacillated like his companion his inconsistency would be attributed to that kinship. In Alcibiades I, at 121a, Socrates, in discussing the idea that the wellborn are generally more virtuous than those of lowly birth, tells Alcibiades that he himself is descended from Daedalus who was a descendent of Zeus. He likens himself and his interlocutor to the lowborn and their ancestors to the wellborn. So, having examined what references we could, does a pattern emerge? More specifically, have we discovered a pattern suggesting that Glaucon’s reference to Socrates as a sculptor is an indirect reference to Daedalus? It seems unlikely. There are two general forms these references have taken: those that focus on the artist and those that focus on his works. 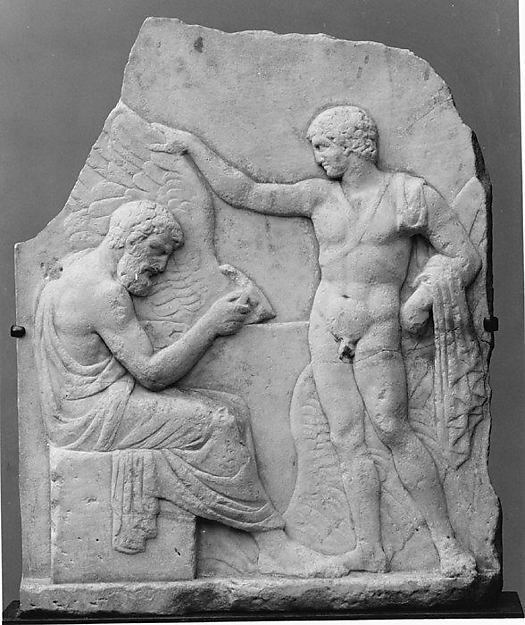 Those focusing on the artist refer to Socrates’ supposed relation to the man, and in a deprecating manner. Those that focus on the art, two out of three times, warn against false opinions. Of course, in Euthyphro, Socrates references both the art and the man. Regardless, Glaucon’s likening of Socrates’ hypothesizing to the work of a sculptor seems more related to the analogy of the philosopher as painter in Book VI of the Republic than to anything else. Just the same, the comparison of Socrates to Daedalus remains an effective analogy taking the painter metaphor a step further. With the painter analogy, we saw the philosopher attempting to translate the truth that he saw in a way that his fellows would understand. Here, with the Daedalus metaphor, we have the philosopher not only relating the ideal but breathing life into it for his interlocutors. The ideas he relates are not inanimate but take on a life of their own and go where they will rather than where the discussants would have them stay. Whether Plato thought of the metaphor or not, it remains a good one. *N.B. There is also reference to Daedalus in Hippias Major, but, as Plato’s authorship of that dialogue is fallen into disrepute, I didn’t see any point in bringing it into this discussion. Plato. (1998). Euthyphro. (T. West, & S. West, Trans.). Ithaca, NY: Cornell University Press. (Original work published circa 380 B.C.E.). Plato. (2007). Republic. (J. Sachs, Trans.). Newburyport, MA: Focus Publishing. (Original work published circa 380 B.C.E.). Plato. (2008). Meno. (B. Jowett, Trans.). EBook #1643. Project Gutenberg. Retrieved from http://www.gutenberg.org/files/1643/1643-h/1643-h.htm (Original work published circa 380 B.C.E.). Plato. (2008). Alcibiades I. (B. Jowett, Trans.). EBook #1676. Project Gutenberg. Retrieved from http://www.gutenberg.org/files/1676/1676-h/1676-h.htm (Original work published circa 380 B.C.E. ).